One of the must see attractions in Seattle is hard to miss if you are driving or riding along 4th Avenue. 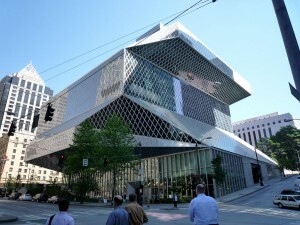 The Seattle Central Library is part of the larger Seattle Public Library system and opened in the spring of 2004. In it’s first year it attracted more than 8000 visitors a day. Total concrete – 18,400 cubic yards; rebar: 2,050 tons. The concrete in the library would cover 10 football fields 1-foot deep. Total steel – 4,644 tons. If you compared the weight of the Statue of Liberty to the weight of the steel in the Central Library, there would be enough steel to make 20 statues. The diagonal grid system is designed to withstand lateral forces caused by wind or earthquakes. Total pieces of exterior glass – 9,994; square footage of exterior curtain wall: 126,767; square footage of interior glazing: 28,963. The glass in the library would cover 5 ½ football fields. About half of the building’s panes are triple-layered glass with an expanded metal mesh sandwiched between the two outer layers. The mesh, aluminum sheet metal that is cut and stretched, reduces heat and glare. Most of the glass is cleaned twice a year, and more often for surfaces that need it.